Just when you thought Brompton couldn't get any smarter with their bike design, they go and do this: the Brompton Electric - a bike designed to change cities. Engineered in partnership with Williams Racing, the Brompton Electric uses a custom-developed, downsized Formula E powertrain to deliver 250W of assisted pedalling via a compact front hub motor. There are four modes to choose from ranging from no assistance at all (the bike rides smoothly without the battery) right through to full-assistance, which maxes out at the 15.5mph UK cut-off speed for power-assisted bikes. Fly up hills. Feel like every ride has a tailwind. See more. Do more. Arrive fresh and on time, every time. 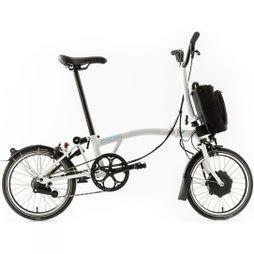 The detachable battery weighs just 2.9kg and is easily carried in a typically stylish Brompton shoulder bag. It can be fully charged in as little as two and a half hours, features a handy USB port for charging mobile devices, and offers a range of 25-50 miles depending on the rider and environmental factors. 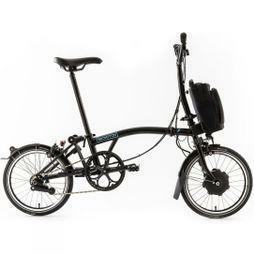 The Brompton Electric folds down to the same compact 23” x 22.2” x 10.6” size as a regular Brompton and is available with either a standard, extended, or telescopic seatpost to accommodate riders of all sizes. Choose from 2-speed and 6-speed models, finished in either Gloss Black or Gloss White with distinctive ‘electric blue’ detailing. Great! How do I get my hands on one? The Brompton Electric is now available to Click & Collect only from one of our Newcastle, Bishops Square, Waterloo Bridge or Victoria stores right now. Simply call in advance or speak to a member of staff. 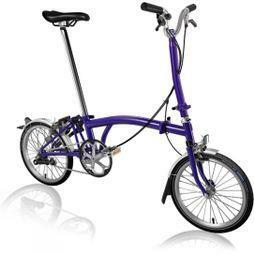 Here's everything you need to know to pick the right Brompton for you. The future is now, and the future is e-bikes - here's how they work and why you need one in your life.